Institutional Review Blog: Can Macalester's Divisional Review Work Elsewhere? Can Macalester's Divisional Review Work Elsewhere? In his contribution to the Professional Geographer special issue, Dan Trudeau of Macalester College writes that "IRBs can be a pedagogical asset, particularly if institutional review practices cultivate the habits of mind and strategies necessary for engaged and reflexive research." The key, his article suggests, may be the devolution of review to specialized committees rather than the general-purpose IRBs that are the norm. But Trudeau does not stress the degree to which Macalester's sucess depends on its departure from federal standards. Trudeau concedes that "obstructive interventions occur; litigious instrumentalism can guide the work of bureaucratic programs, including IRBs; and I am genuinely sympathetic to the translation problems that stem from the evaluation of interpretive research from a framework attuned to experimental science." But he insists that "these instances should not, however, be mistaken for necessary characteristics of IRBs." Trudeau has chaired the Social Science Division of the Institutional Review Board (SSIRB), which "reviews research protocols that faculty members develop for courses that integrate social research into the curriculum" and "proposals that students develop for original research." It does not review proposals bearing greater than minimal risk, such as "Highly sensitive research involving vulnerable populations." Nor, as I understand Trudeau's article, does it review the faculty's own research. 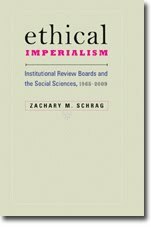 Trudeau praises the SSIRB for helping him teach research ethics. The capacity for [my undergraduate] course to offer enduring lessons about the practice of ethics in human geography research has been greatly enhanced through my interaction with the SSIRB. Submitting a protocol helped me develop and organize curriculum that gives explicit instruction on ethically responsible research conduct. Furthermore, and most important, the SSIRB gave supportive, critical feedback on developing procedures to ensure informed consent and confidentiality. For instance, the SSIRB suggested that I integrate into the course multiple instances for students to consider the research ethics implications of the multiple roles that they will have in their research sites. In practice, I have convened conversations with students about their perceptions of and approaches to their roles as volunteer and researcher. Such conversations have also provided a forum for students to raise additional ethical questions and think through the ethics in practice of the research. Specifically, these conversations have helped both students and me to anticipate potential conflicts or troubles that might arise when one is both volunteering and researching. It has also helped students work collaboratively to generate strategies that address the troubles that do arise, including how to represent research participants in ways that respect individual privacy as well as individuals’ unique relationships with community organizations. Trudeau notes that Macalester's "approach has emerged in an institution that explicitly focuses on undergraduate education. This approach is thus likely tenable for a select set of institutions." Indeed, the big question here may be what elements of the Macalester model can work at larger, more research-intensive institutions. I have long been interested in departmental review as an alternative to the general-purpose or social-behavioral IRBs that force qualitative and quantitative, experimental and observational, and field vs. lab researchers to pass judgment on research methods they do not understand. Trudeau's article suggests that there is real value to this approach. But it is important to note that the SSIRB and Macalester's other specialized committees are not empowered to review high-risk or federally funded research. So they aren't really IRBs at all, if we take "IRB" to mean a committee that meets federal standards. And real IRBs can't function the way Macalester's committees do. Macalester allows departments to form their own ethics committees. Official IRBs can't allow this, since the Common Rule states that "No IRB may consist entirely of members of one profession." Macalester's committees can be small, needing only three faculty members. This likely facilitates scheduling, deliberations, and communication. Official IRBs must include five members, including non-scientist and non-affiliated members. Because they do not review federally funded research or meet federal membership requirements, Macalester's committees are not subject to OHRP audit. Thus, if they make a mistake, they do not risk a suspension of the entire college's federal research funding. I would suggest that this may be a big help in developing what Trudeau calls a "high-trust set of assumptions"; it's easier to trust a committee whose failure won't wreck the college. While I am grateful to Trudeau for calling attention to Macalester's successes, I don't think he has shown that obstruction and inappropriate demands are not "necessary characteristics of IRBs." The good work done by Macalester's unofficial ethics committees reinforces rather than challenging the claim that official IRB pathologies are the product of federal regulations. Thus, if the Common Rule is extended "to all research that is not Federally funded that is being conducted at a domestic institution that receives some Federal funding for research with human subjects from a Common Rule agency," as proposed by the ANPRM, the island of sanity that is Macalester's SSIRB may be swept away. I wonder if it is worth distinguishing between people who do something professionally and a profession? I don;t think it is necessary to think of social science, sociology or, even, history as a profession, in the sense that medicine, law or the clergy is, even if we think that these activities can be done professionally. Thus, that problem can be made to disappear. Alternatively we might also draw the boundaries around academia per se rather than focus on particular disciplines. As a result the problem would then be largely insurmountable and therefore the required should be subject to greater scrutiny. We might consider what the spirit of the requirement is, presumably the independence of ethical review through ensuring a diversity of reviewers, more explicitly link it to the lay membership, and rethink formal constitutional requirements from there. Robert Klitzman has suggested that the community member requirements aren't meeting their goals, and Trudeau's essay suggests that committees without such members may work better. Unfortunately, federal policy has long insisted on single models of oversight, rather than comparing possible alternatives.